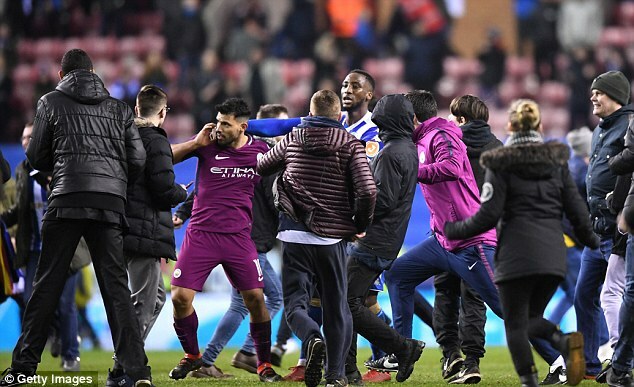 The English FA are believed to be gathering available evidence before making a decision on the incident involving Manchester City's Sergio Aguero and a Wigan fan after the later invaded the pitch after Manchester City lost to Wigan in the FA Cup last night. The Football Association will also review an incident at half time that involved City coach, Pep Guardiola and Wigan Manager, Paul Cook. The FA will already have the report of referee Anthony Taylor, who has already submitted his match report, and will also look at various other evidence before coming to a decision. Emotions boiled over after City's full back, Fabian Delph, was given his matching orders for a two footed lunge at Max Power, a decision that left the City bench fuming. This led to the confrontation in the tunnel. Guardiola, who had issues with Cook for encroaching in his area confronted him during half time as both teams made their way to the dressing room. And at the final whistle, things further went south when Wigan fans took to the pitch to goad City fans who were seated at the back of one of the goal posts. This led to objects being thrown, including the advertising boardings. One of the fans seems to have something against Aguero, and looked as if he was about to attack him. Aguero didnt take lightly to that and reacted by going for the fan. He was held back by coach Mikel Arteta, who lead the Argentinian away. The FA have will no doubt fine Wigan for the pitch invasion, but it isn't clear what measure of punishment would be melted out to City whose team and bench were important actors in the whole fiasco.